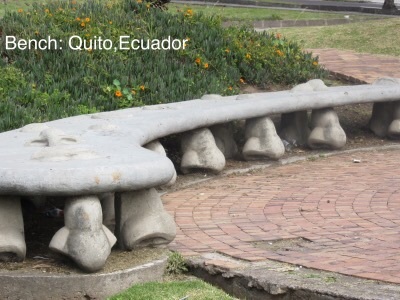 This bench, and 2 others like it, is located less than a block from the South American Explorers Quito Clubhouse, where I am staying until Sunday, Feb 1. The 2 pickpockets scurried across Av. Rio Amazonas during a lull in the heavy traffic. Just before reaching the curb they split up, with one fast-walking ahead and the other inserting himself in the flow of pedestrians a few steps behind me. Seeing them for what they were, I immediately turned toward the street and maneuvered myself close behind the trailing thief. I closed in on him and when he realized what happened, he kept looking back: over one shoulder then over the other. It was my first morning in Ecuador. WELCOME TO QUITO, GRINGO! There are a few things to note about this little episode. The first is that Quito can indeed be a risky place. But having grown up in Detroit, I learned early on that Motown was no picnic either. It was pure luck that I saw these slimeballs and I’m no Captain America with danger radar protecting my every move. Although since then I have not seen anything that could vaguely put me in harm’s way. But that also means that I don’t walk down the street swinging an expensive camera, wearing a pair of cargo pants stuffed with expensive toys. I also don’t stop on the street to puzzle over a map. Quito is really no less safe than any big US city, but you just don’t advertise your wealth; this is the capital of a developing country and few Ecuadorians have the financial resources that travelers have, so don’t flaunt what you don’t want to lose. What I have seen this first week is a fantastic variety of produce, and the SuperMaxi, a be-all grocery store in the elegant El Jardin mall offers easily 2 dozen more fruits that one could buy at the local Safeway back home. I’m drinking raspberry or blackberry juice every morning and papayas are less than 1/2 a buck a pound. This entry was posted in Uncategorized and tagged Quito on 2015-02-01 by kmalivuk. This one has a happy ending, sort of. As you wade through the responses the common thread is awareness at all times. It sounds onerous but in reality, what else is there but awareness? It is such a disappointment walking down the street, whether here in Quito, or in Honolulu, or Albuquerque or elsewhere and constantly seeing individuals who have traded the reality of here and now for the distraction of a “smart” phone; where are the smarts? Someone once said that if you listen to all the State Department warnings then you won’t go anywhere. So while I did read the cautions about Ecuador, I still went ahead with my plans and don’t regret it for a minute. Change of scenery do you good, so they say, and I believe it. St. Peter, the Rock, beckons. So you have a Spanish teacher. Immersion, livein kind? Fill us in on the details when you have a chance. Shon may be on to a workable solution for the firetruck access issue. Maybe we will soon resume construction…. As it happens the seats of the 3 “Nose” benches are embellished with lips and ears! I guess the artist is a body-parts aficionado. In any case, I couldn’t pass up a shot or 2 of the works.